Last week’s look inside an Amish home drew quite a few comments, here on the website and on our Facebook page. Some of you felt the home was beautiful. One commenter “love[d] the simplicity.” Others felt the home looked “a little fancy for Amish”. It made me realize we all have different ideas of what an Amish home “should” look like. The Amish, as tends to be the case, don’t always follow the script. For example, there is quite a difference between an austere Swartzentruber home interior and the fancier New Order Amish home we featured last week. Which one is really “Amish”? There are different ways of being Amish, so the best answer might be “all of them”. That noted, there are common features you’ll find in most Amish homes. Here are five. Note: Amish homes are not all the same. Some are plainer and others fancier. The features here are general ones which you should find in many, but not necessarily all Amish homes. In some cases below I’ve noted alternates for plainer homes. Linoleum is inexpensive and durable, and comes in whatever design or color you like, including “plain”, or “plain-ish”. It’s relatively easy to install, and it’s easy to clean. Amish use linoleum everywhere, from the bathroom to the kitchen to the living room to bedrooms. Linoleum won’t be found in every Amish abode, however. Examples where it’s absent include the houses of Troyer Amish and Swartzentruber Amish. As Karen Johnson-Weiner notes, floors in the homes of the latter are unvarnished hardwood (see New York Amish: Life in the Plain Communities of the Empire State, p. 61). The farm home of one of my Amish friends is actually two homes in one. A common parlor room links the two households. Doors on either end of this central space can be opened, leading into the living area and kitchen of each home. When the doors are opened, it creates a huge space. Like half a football field long. Okay, maybe not that long, but it’s a distance. You can look across from the very end of one house to the very end of the other. The space created easily accommodates the dozens of youth when they host singings. 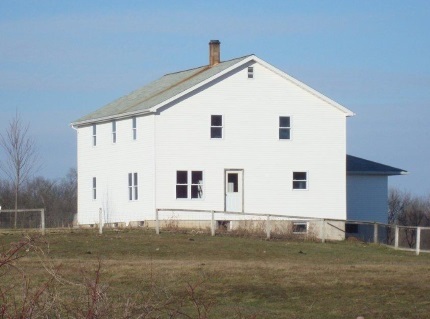 In this case, the roughly two-century-old home was originally English-owned, so I’d assume not built by Amish (Note: the photo above is of a different home). But a similar principle, of large spacious areas, applies in new Amish construction. This didn’t hit me until my father, who had a builder’s eye, visited Amish homes with me and observed how wide open the rooms felt. I believe Amish like spacious areas for a few reasons. Obviously, with larger families, larger gathering spaces are needed. They also allow a single light source (or two) to illuminate a larger area. Lighting varies among Amish. Propane or natural gas lighting is used in many homes. 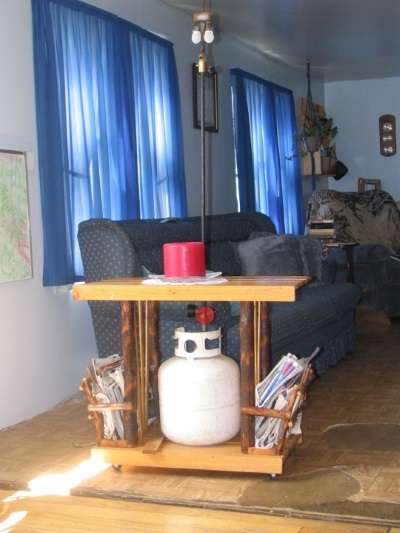 Propane lanterns may be hung from hooks in the ceiling, which in turn is protected by heat shields. Larger mobile units (pictured below) include a propane tank and wheels which allow them to be easily moved to where light is needed. And in some homes, such as the one we saw last week, the lighting system is incorporated into the home itself, with fixtures built into the walls in each room. More conservative Amish rely on oil and kerosene lamps. Amish in this category include the Swartzentruber Amish or the community at New Wilmington, Pennsylvania. These produce a dimmer glow than the above, but also less heat, which can be a plus or minus depending on the season of the year. But sometimes, you might see regular electric light switches on the walls of an Amish home. Why? The home you’re in was previously English-owned. You can flip them if you like, but don’t expect much to happen (yes, you know I’ve tried more than once 🙂 ). Besides the above, you’ll also find a variety of battery-powered lighting, including flashlights, and LED lighting in some homes. On the outside, the refrigerator we saw in last week’s photos looked like any you might see in a non-Amish home. However, the ones in Amish homes are powered by propane or natural gas. These are made by at least two companies I’m aware of–Crystal Cold of Arcola, Illinois, and E-Z Freeze, based in Shipshewana, Indiana. They’re marketed to non-Amish buyers as well as Amish. In Amish homes where they’re not permitted, ice-based cooling is used. We have recently seen examples of ice houses and ice harvesting in some settlements. In other communities, such as Geauga County, commercial ice services are popular. They’re a nice, cool place to store food and canned goods. They’re a great place to do the laundry. Splash some water on the floor, no problem. You can squeeze 100 or so people into them, making them a functional place for church. They make a good play space for children. Some Amish essentially live in their basements in warmer months, eating and spending at least the daytime hours in the cooler basement area. No matter how you slice it, basements are handy. They’re even good for a quick workout, as you can see in the photo above. 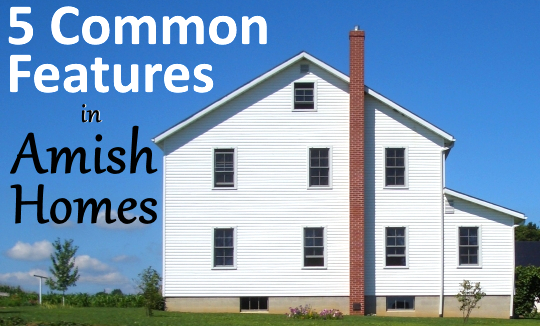 What other features have you noticed in Amish homes? Some Amish have varnished wood floors. 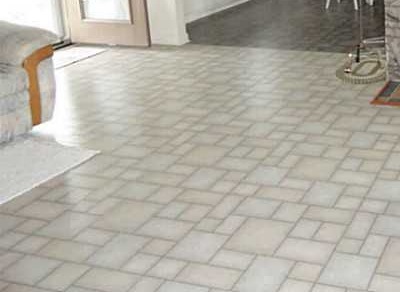 It’s interesting that such flooring has been highly desired and emulated in many non-Amish homes in recent years, at least with laminate flooring. 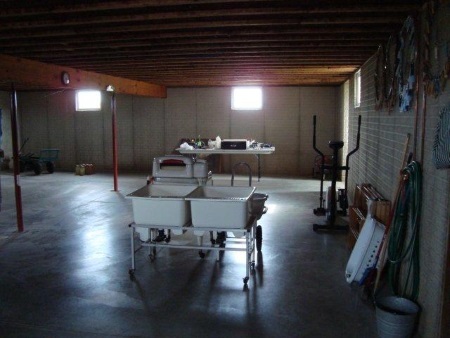 Huge rooms on the main floor are also used to host church services, unless they have a basement, shed or barn available where it takes less preparation to move furniture. In some areas, you’re almost not Amish if you don’t wear a headlamp to make light outdoors in the dark hours. In Windsor, Missouri, refrigerators are fueled by kerosene. Basements are a cool place in the summertime to take naps or sleep at nighttime. You asked what features are in Amish homes. Window coverings are often pull-down shades, green or white, or homemade sheer curtains in a solid-color fabric. Great details here Linda, thanks! I had to chuckle when I saw the work out equipment in the basement. I figured with all the physical labor the last thing they would want to do was work out. Thanks for sharing this info. It shows that Amish have different personalities and how we think they still live in the 1900s. 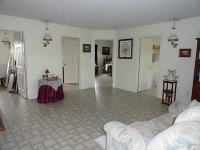 I think we Americans have a common interest in seeing the inside of peoples’ homes. That is what makes HGTV so popular. Maybe we think it shows who people are in real life. I don’t know why but I like seeing inside myself. I can’t stress enough the importance of NEVER taking a portable propane cylinder inside a building. I’m amazed the Amish knowing how propane works and the laws regulating it’s use preventing this type of use is still common. NFPA 54 (National Fire Protection Agency) Standard covers all low pressure systems and appliances. NFPA 58 regulates high pressure and liquid storage. Propane tanks and cylinders never go inside an enclosure or building. When filled, it is done outside, when you go to a store with a cylinder exchange, there will be a sign prohibiting the cylinders in the building. Even installed outside, the pressure relief valve should be positioned away from the building. When they release, they sound like a 22 rifle going off. ONLY low pressure gas vapor is allowed inside any building. Notice the RED regulator on the cylinder pictured. That is a high pressure 10 pound regulator for outdoor use only. Indoor pressure must never exceed 1/2 pound pressure. Natural Gas is 1/4 PSI. Liquid inside the pressure vessel is under extremely high pressure (pressure relief I believe is 275 PSI). Every drop of liquid expands 270 times itself when released as it goes from liquid to vapor. Propane is safer than gasoline since it mixes with air very fast and becomes too lean to burn very quickly. Indoors, it is confined and makes an explosive mixture that can’t dissipate. Firemen are used to aerosol cans and other things popping around them inside a burning building, but no one has a chance of surviving an explosion from a cylinder stored indoors. Even an empty cylinder has 100% propane vapor inside and cannot be made nonflammable. The reason the flame goes out when you run out of fuel, is the 100% vapor has no oxygen inside the cylinder and is too rich to burn. It takes 70 buckets of air to one bucket of propane vapor to burn. That mixture is very easy to accomplish storing a cylinder inside with any leak. Retired owner from propane service business 2008. 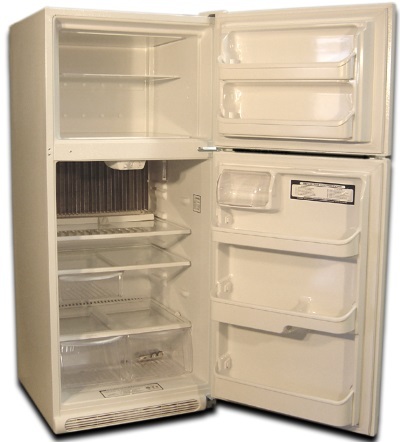 Magic Chef also made ammonia refrigerators and Servel is the largest maker today in the US. They make the Dometic brand for RV use and compete with Norcold Corp. They even come in double side by side door models. Before Firestone became the large tire manufacturer, they made appliances and Goodyear did as well. Some are still in use. They do add heat to the home. Heat from boiler chamber and food inside rises off the coils on the back and is exhausted outside in RV’s and smaller areas. It is exhausted into the building in larger areas and adds to the heating of the building in winter as well as gas lights. They can heat a small room easily. Paul, I appreciate the info about propane and propane cylinders, since our stove is propane. We have considered getting one of those pressurized lamps, partly for the heat they put off in the wintertime, but based on this info, I think we won’t. Naomi, They are safe as long as they are low pressure, but require the piping to be black iron within walls. Not copper. They are also quite loud with a constant hiss that is hard to get used to. They also use a mantel like a Coleman lantern that needs replacing from time to time. As far as lights, most places where they allow solar panels they also allow battery lights instead of the gas. Thanks for posting this Linda. This was one of my questions when writing this post. An Amish friend I recently asked told me he thought what they had was made of vinyl but that they called it linoleum. As that article points out linoleum seems to be the commonly used word even if it’s not technically linoleum and the two have different characteristics. There are a number of references to linoleum flooring in literature on the Amish, but haven’t found a mention of vinyl yet. I have heard that many (I believe in some areas most) Amish homes have plumbing, rather than using a hand pump and outhouse. But most Amish don’t live in town. In my house in Elkhart County, there’s no city water, and every house has its own well with an ELECTRIC pump. How do Amish power their water pumps? I haven’t noticed generators running 24/7, and not all have a wind turbine. Or do they use a different method to maintain water pressure? People on city water flush a toilet and don’t think a thing of it, but when you live out in the county, you are well aware that a power failure means no water! I once spent four or five days straight having to haul buckets of water from the swimming pool for every flush. They can weigh a ton and were the first automated water pumps made. They are positioned in the basement next to a hand dug well. A wood plunger rod goes up and down into the well (like a hand pump)as the flywheel is turned. You build a fire in the engine like a small stove, and one cylinder builds pressure getting hot, and a second cylinder gets cold with the water flow through a water jacket around the cold cylinder. Hot expanded air is cooled and creates a vacuum. This pressure differential runs the engine on the hot and cold air. They only need to be ran once a day to fill a tank usually in the attic that gravity feeds the system. It’s very common around here to find a frozen broken old system in an attic that was replaced with a new style pressure tank connected to a submersible pump that replaced the turn of the century system. The high mounted tank had an overflow pipe that you would pump into the tank until water ran out the overflow showing it was full. Other ways to fill a gravity tank are belt drive off a tractor, hit and miss engine, or steam engine. They are portable and used for other things as well. Heller-Aller Pumps now owned by Hitzer Stoves in Bern Indiana makes a hand pump and heavy duty version for connecting to windmill or other automated means. Where Erik is this week, he can see some Stirling engines if anyone is around the Rough and Tumble Thresherman grounds and museum on RT 30 in Kinzer. A working hydraulic ram is in use at the old Shirk Farm on Shirktown road near Churchtown and Narvon. You can hear it clapping away close to the road. The homes and shops I get into are not the average farms since they are steam mechanic friends that do steam engine and traction engine repair. They are welding and stove fabrication shops with their own steam powered generators and more elaborate homemade systems. A battery bank (automotive or marine deep cycle battery) can be used to power an Inverter that converts 12 Volts DC to 110 volt AC (household current) for a pump as well. Solar charger charges the battery while not in use. Shur-Flo also makes 12 and 24 volt pumps but aren’t capable of deep well pumping that requires 110 and 220 Volt AC. Thanks for this very informative answer! Hot air rising above stoves through floor vents is common, and should also incorporate a floor vent farthest away from the heat source for the cooled, heavier air to drop back down for proper circulation. (many times down steps) Codes now require a heat actuated damper that closes in the vent between floors in case of fire. I have noticed that Lancaster Amish have linoleum on their bathroom walls as well. Oops. Completely unintended pun on a common Amish surname. Well done, even if by accident Naomi 🙂 It’s true you can get quite a few Lapps around the table in one of these rooms. When you include the basement there is quite a bit of potential play space in these homes. I, too, felt the home pictured was very fancy for Amish living. I do not believe one would find that in our are Amish settlements…unless it was newly built my Amish coming from another state etc. and that is a “maybe”. Window treatments: yes, one sees the white curtains always pulled to one side but also there are)heavier navy (I believe) ones that I would assume are pulled to aid in rooom darkening and keeping out cold/heat drafts. Those are pulled along with the white still showing. Floors: have only seen the wooden floors around here. I once was able to visit a home which had prepared for the wedding of their daughter. It was completely set up…all levels …with tables and benches , tables settings in place (for this many…yes, many different ‘plain’ patterns used), wedding cake (baked/decorated by the bride..she had stayed up til 3 or so in the morning frosting it etc) in a corner with small ‘gifts’ for wedding party participants, napkins hand stamped with names/date of event, …The bride had also made small business size cards to hand out that were hand stamped and colored with groom and bride names and date of wedding on it. Everywhere you looked in the house were the benches and set tables!…so yes, the large rooms are a must for all of the above AND weddings! Cool follow-up. Very much enjoyed reading the comments too. The most refreshing thing about these photos is the lack of mountains of STUFF. That basement is the most uncluttered space I have ever seen. That’s one of my favorite features too Ellen! By the way for some unknown reason yours and a few other of the comments here went into moderation and so weren’t visible immediately. I was just now able to get to the internet and get them up. Sorry about that to anyone who commented and it wasn’t visible right away. On rare occasion the filters do that to legitimate comments, so if your comment doesn’t appear immediately, I regularly check and will approve it if it’s in there by mistake. Today things are snowy around Lancaster 🙂 I am traveling to visit the Amish settlement in Somerset County on my way home to NC (well…sort of on the way home), and it is coming down pretty well right now. This morning I noticed the Amish family I ate breakfast with had a propane refrigerator by another maker called Diamond. According to one site these are made by Amish in the Midwest, though exactly where I don’t know. The Amish where we lived used a gas powered engine to pump water up to a storage container (like a milk truck container). This would fill it and then the house is gravity fed water. Depending on water usage, it wouldn’t have to be run too often. When the pump is running, there is great water pressure. It is also pretty good when the tank is full. As the tank gets emptier, the water flow slows down quite a bit. A Swartzentruber family who live withing walking distance of us and whom we know well recently finished laying (gorgeous!) oak flooring in the first floor of their home. Although they didn’t apply varnish or polyurethane to the wood, they did seal it with oil. The wife called it “mineral oil,” but I believe it was linseed oil, instead. The plan is to sand and apply a second coat in a few months, which when dry will leave a finish that looks much like hand-rubbed poly. By the way, the Swartentrubers around here do business with a hardwood flooring supplier in Ohio. The company sends a salesman into the area, who assembles truck-load orders. The cost per square foot, delivered, is less than some vinyl products. I am told that the company will combine Amish and English orders, so everyone in the area can benefit from the great deals offered (although an Englishman may need to pick up his part of the order from an Amishman’s house!). Our friends found carpeting and vinyl on the floors of the old farmhouse when they purchased it. They removed the carpet and painted the plywood subfloor as a temporary measure, although they left the vinyl in place for a few years, until the hardwood could be installed. Interesting read and I appreciate, Erik, that you bring out the differences in the orders. We know Swartzentrubers well – the parents of our son-in-love – and have been inside their home (the daudi haus) several times. The wood floors are rich quality, shiny. This couple has no rugs anywhere, just the wood flooring. It’s a two-story home. Kerosene lamps. A hand pump by the kitchen sink. The walls are bare with the exception of a calendar. The furniture is handmade, wooden, no cushions. The window coverings consists of a single blue panel, which our SIL’s mom would tie back during the day. Outside, there are no flowers planted, as this is seen as vain and prideful. Yet, I noticed a hummingbird feeder hanging from the front porch. My SIL once told us that he thought dandelions were “pretty flowers” because that’s all he was permitted to see in the absence of planted flowers. I actually posted about one of our visits, “Time Warp” on my Beyond Buggies and Bonnets blog. It certainly is another world to me as I grew up in the city. I know about the water pump in Mark’s house because I was partly the cause of him changing it. When he moved there the water pump was powered by a gasoline Honda engine. It pumped up air pressure or something. Paul would know. You would have to fill the gas tank every once in a while. The engine and water pump were in Mark’s old cellar. I was forbidden to go down the old creaky steps into the old cellar. But, if the water ran out and Mark wasn’t home I was supposed to call one of the neighbors to come and pull the cord and start the pump engine up. This was when I still lived in Florida and used to come up and visit Mark. Then, Mark got tired of running up and down the steps and the local Amish engine shop put in a modified Honda engine that runs on propane. It starts and stops automatically. The starter is on a battery that is charged up every time the engine runs. I’ll tell a story on Mark. One time he was taking a shower. He was all soaped up with shampoo in his hair and the water ran out. He had to get out of the tub and trudge down into the old cellar in his bathrobe to start up the pump. It wouldn’t start. The engine was out of gas. Mark had to come back up and go down into the new cellar where his washing machine is to get the small gas can he keeps there. Picked it up. Empty. Now he had to go back to his bedroom, put his clothes on over his still soapy body and shampooed hair and go out to the barn where the big gas cans are to fill the little can so he could bring it back in the house and fill the gas tank on the water pump engine in the old cellar so he could go take his clothes off and finish his shower. Wasn’t too long after that that Mark had his propane water pump system installed. I wonder why? I think Don Curtis tells not only the funniest , but the best stories on all of Amish America. I especially like the ones that involve his son, Mark. I almost feel as if I know the two of them. Maybe that is why this is my favorite site to visit on the whole WWW thing. If you hover over the picture of the property, and click on “Learn more at hotpads.com”, more photos of a house interior or exterior should come up. Such a fun post! But I thought lineoleum floors were expensive? Do you mean vinyl flooring? I want to install some since I remember these floors from childhood but I forgot if it was linoleum or vinyl. Compared to a natural floor surface like wood or stone I think vinyl and linoleum come in a good bit cheaper, at least material costs. I am going to look into it. They are marketing linoleum as natural and charging a lot more than I thought it would be. I remember linoleum being cheap and it makes the house seem so homey to me. I remember the linoleum and the high gloss paint on the walls. I miss it! Thanks! If you’re talking what we call “inlaid” linoleum, it is expensive and the last we checked, it only comes in 6 foot widths. We did get a remnant for a bathroom and are very pleased. One thing I remember from my very young years was a big wooden table, like the old farmhouse style, just a plain rectangle, without scrollwork or any flourishes like that, and benches instead of chairs along the sides. The more I read, the more I suspect “my” family was possibly Swartzentruber. Thank you for all of the information. I read that the benches used for folks to sit on during Church services are afterwards used as tables. How can that be? Each bench-wagon carries wooden “legs.” I could draw them better than describing them. 🙂 These wooden legs have a groove in them that the bench-legs fit into and this will raise the benches to table-height. Two benches of the same length will be fit into these “legs”, one set of “legs” on each end of the two benches and there you go — two benches have become a table! Benches of the same length are placed along each side for seating. Cover the table with a tablecloth, set out the food, cups, and cutlery, and you are ready to serve church-lunch. The nice part about that is the tables can be made any length the benches are. Our district uses 8 ft. benches as our longest ones, but some have 10 footers. We naturally use the longest ones possible so more people can be seated, but depending on the length of the room, we might need shorter benches for one table to allow people to get around it. |-| is kind of how these “legs” would look from the side… with the groove on the top being where the bench legs would sit in. That makes a lot of sense! Thank you for explaining.